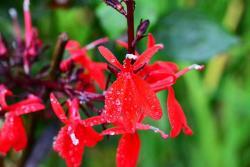 Cardinal flower (Lobelia cardinalis) has crimson red flowers that make an impression from a hundred yards away. One of the most spectacular and easiest wildflowers to grow, all it asks is to be planted in a suitable location. Native to the swamps and wetlands of the eastern half of North America, cardinal flower is a perennial species with the uncommon habit of thriving in wet soil and shade. 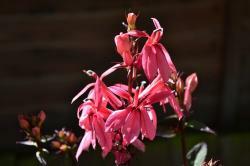 It grows three to five feet tall, blooming from the top of its thin, lanky stalks from mid-summer through early fall. The top one to two feet of the plant becomes covered in bright red tubular blossoms, which are extremely attractive to hummingbirds. Its 4 to 6 inch oval-shaped leaves have a lustrous appearance and are often seen in purplish or reddish tones that really set off the colors of the flowers. Cardinal flower is easily naturalized in gardens within its native zone, making it an ideal species for habitat gardens. 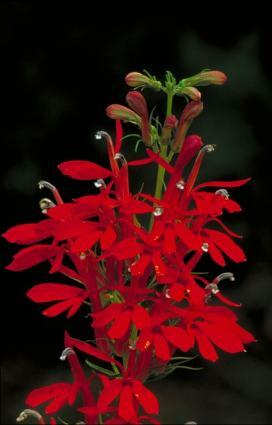 Plant cardinal flower in rich soil, ideally at the edge of a pond or bog garden. 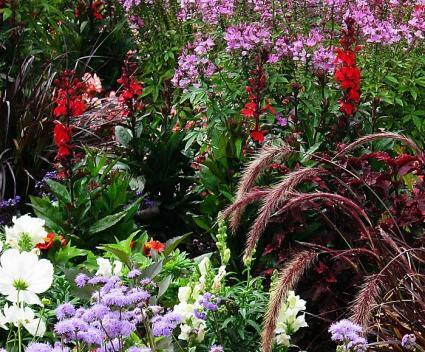 They will also grow happily in a flower border with other perennials, but they must receive regular irrigation. Cardinal flower tolerates full sun or part shade, but if planted where there is not constantly moist soil, it's safer to give it a position with afternoon shade. Other than supplying water, care is minimal. Keep the plants well mulched to conserve moisture and cut back the flower stalks in late summer by about 50 percent for a second flush of flowers in fall. In winter, the stalks can be cut to the ground, as the plant will sprout again from the roots in spring. Pests and diseases are uncommon though fungal pathogens may show up if air circulation is poor. Fungicides are an option though most gardeners prefer to cut the plants to the ground and let fresh leaves regrow from the roots. Cutting back adjacent vegetation to create better air circulation and let in a bit more sunlight in shady places can help tremendously. In wet, partially shaded places cardinal flower tends to seed itself, forming a wildflower garden all on its own. For this to occur, make sure to wait to cut the flower stalks down until after the seed has ripened and been dispersed. There a number of improved cultivars of this popular wildflower, including a spectrum of flower colors besides the typical crimson variety. Queen Victoria has burgundy stems and leaves with crimson flowers. Black Truffle has deep purple, almost black foliage, with crimson flowers. Angel Song has salmon and cream flowers. Cardinal flower is a show-stopping species with the potential to naturalize in the landscape, making it both easy and gratifying to grow. Plant it with other native wetland species, such as rushes and sedges, for a lush landscape that doubles as wildlife habitat.